Here we have an eighties MIJ maple Tele neck that happens to be almost perfectly straight and just needs the original frets replaced. This will make for a pretty straightforward re-fret. 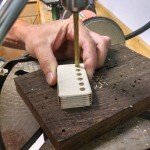 Before I do anything I need to check the radius of the fingerboard using the Mojotone radius gauges. These come notched or un-notched for any situation. This customer wants a jumbo feel without being too high. We agreed to go with Mojotone jumbo fret wire with a crown width of .102” and crown height of .039”. It’s got that old Gibson jumbo feel. I carefully removed the frets using heat from my soldering iron with a notched chisel tip and small fret nippers. 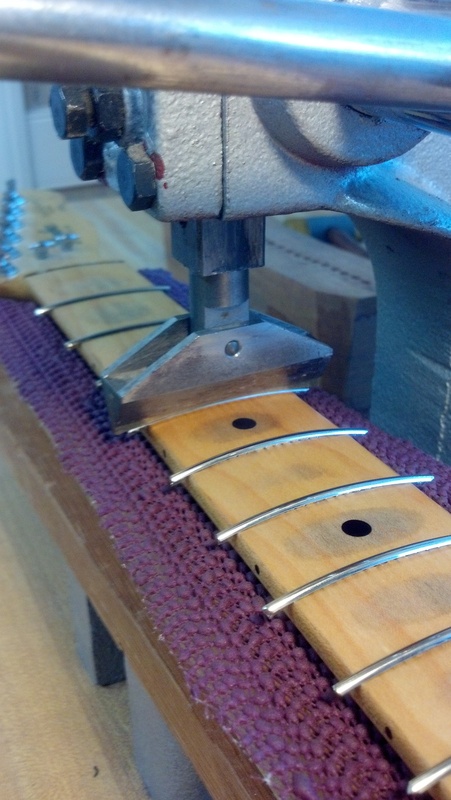 Tip: Tighten the truss rod to introduce some back bow into the neck. This really helps the frets come out easier. I have to be careful not to use too much heat or I’ll burn things up and not enough heat will chip the board. This neck doesn’t have any plastic binding or heavy finish over the frets so I can heat things up pretty good without too much concern. 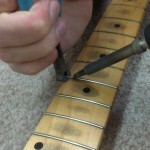 The fret slots should be perfectly clean without any chips after the frets are removed. 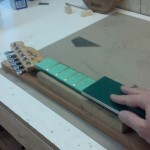 It’s important to test the fit of the fret tang making sure it isn’t too loose or too tight. This Mojotone fret wire happens to fit these slots perfectly. 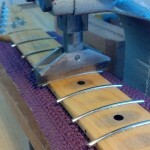 The fret board and fret wire gets cleaned and prepped before the re-fret. 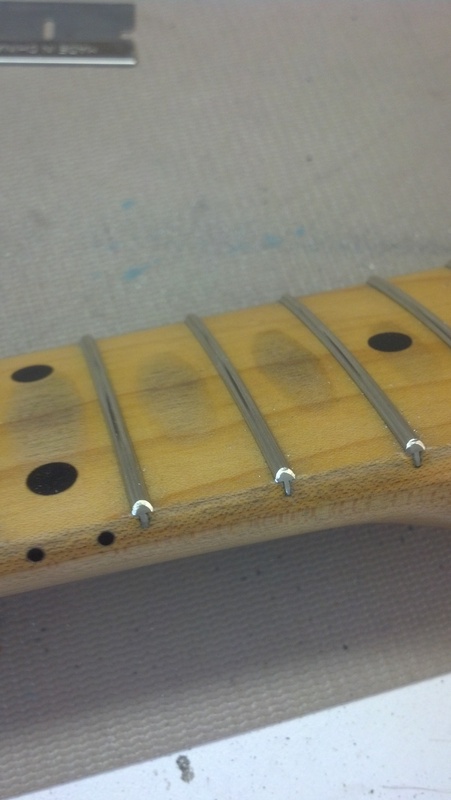 I use distilled white vinegar for cleaning the fret board and mineral spirits for cleaning the fret wire. I bend the fret wire slightly more than the radius of the fingerboard and cut them to length with a little over hang on each end. I adjust the truss rod until the fingerboard is flat. 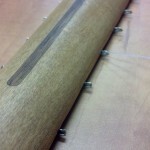 Then I tap the ends of each fret into the slots and press them until they are fully seated. 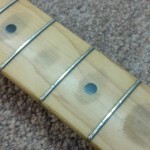 Tip: When using a fret press, try not to over radius the fret wire before pressing it in because it may cause the fret to spring up in the middle. Especially with large or extremely hard fret wire. After pressing the frets and seating them tight, I’ll check 3 frets at a time to make sure they are as level as possible with each other, without the straight edge rocking back and forth over any high frets. 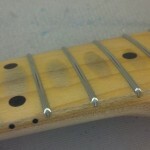 I don’t want to do any heavy leveling or crowning after the re-fret. Once I have everything level, I can glue the frets in. I use different glues for different jobs and I don’t want the frets working themselves loose or un-even. After all wood does expand and contract and moisture can cause lots of issues. For this job I chose to use Mojotone Thin TruGlu. I can wick the glue around each side of the tang until they are secured. 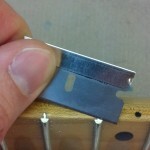 The frets can easily be removed again if another re-fret is needed in the future. Now I can clip the excess fret wire flush to the board and bevel the edge with a file. I need to be careful not to remove material from the fingerboard when filing the bevel into the frets. 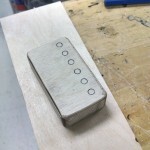 Once I get close, I use a flat block with 320 grit sand paper to bring the beveled edge flush to the edge of the fingerboard. 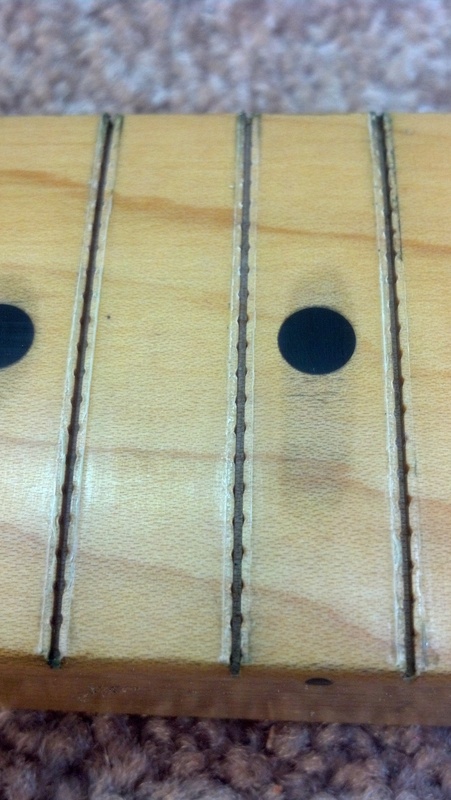 Sometimes there are imperfections along the fingerboard edges which can cause some of the fret material to to roll over the edge from filing. 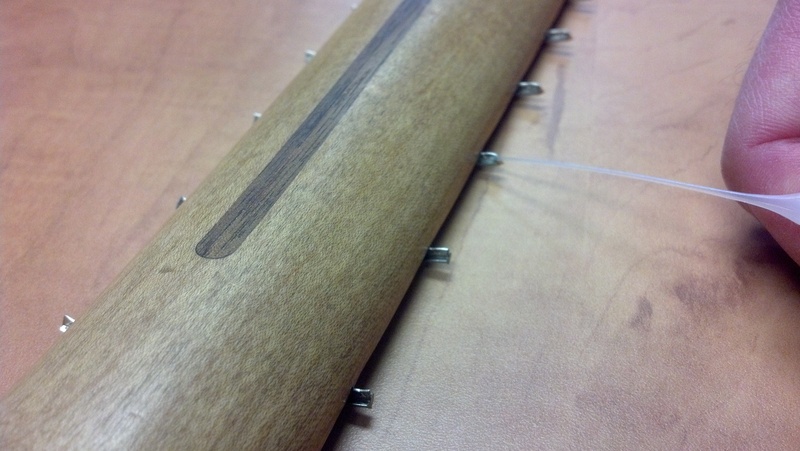 You don’t want to keep filing until it disappears or you will remove fingerboard material. 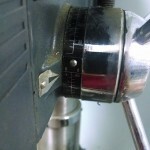 I pick the rolled edge away using a thin razor blade. Then I follow up with 800-1000 grit sand paper to knock it off and remove any scratches. Tip: When beveling the frets, it is important to adjust the angle of the bevel according to the string spacing from the edge of the fingerboard and the fret height. That higher the crown, the further in the bevel will go in. 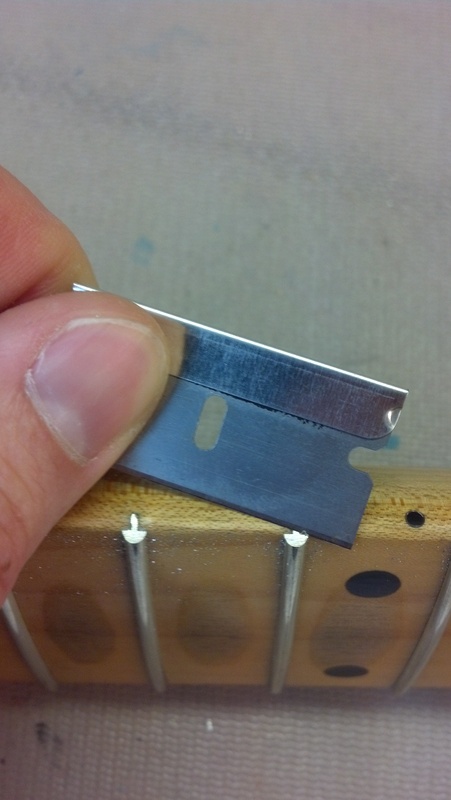 You don’t want your string popping off the edge of the fingerboard because the bevel is too steep! Time to dress the fret ends using a modified 3-corner file with the corners smoothed down to keep from scarring the fret board. 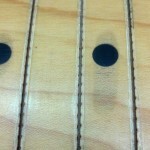 I round the fret ends evenly down the entire fret board until they look and feel absolutely perfect. 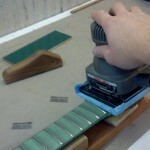 I tape the fingerboard off and expose the frets for their final fret level, crown, and polish. I used green painters tape for this neck because it’s low tack and removes cleanly. Sometimes I don’t use any tape at all because the finish is too delicate for any type of adhesive. 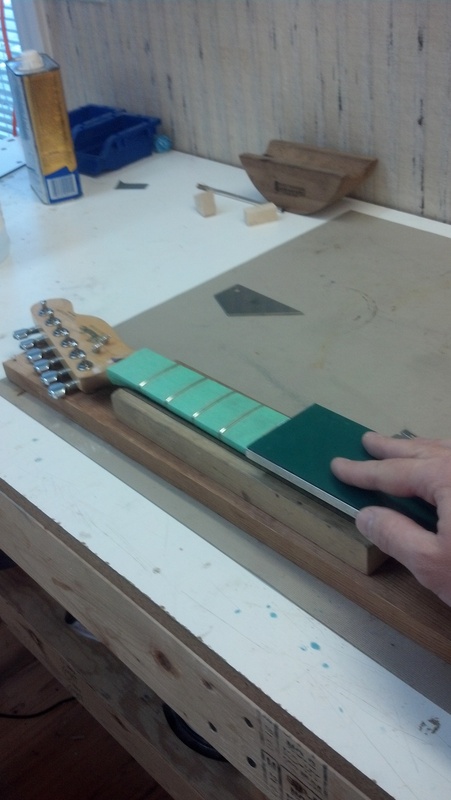 I make sure the fingerboard is perfectly flat and the back of the neck is fully supported before leveling the frets. 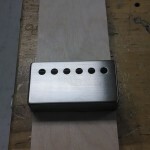 I use the 800 grit Mojotone Japanese diamond honing stone to level the tops of the frets evenly across the board. 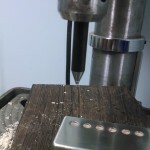 Tip: After leveling the frets in the direction of the fingerboard, carefully run the stone back and forth in the direction of the frets until the cross scratches are gone. This makes for smoother bends without any friction. The frets are perfectly level now so I can go through the grits of sandpaper until all of the scratches are gone. I do so carefully as I don’t want to make the frets uneven from being careless. Once I have worked out all of the scratches, I can polish the frets to a mirror shine. I use a palm sander with a folded blue shop towel attached to the pad. Then I rub some metal polish into the pad and let her rip. 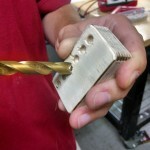 The palm sander polishes all of the frets in seconds. 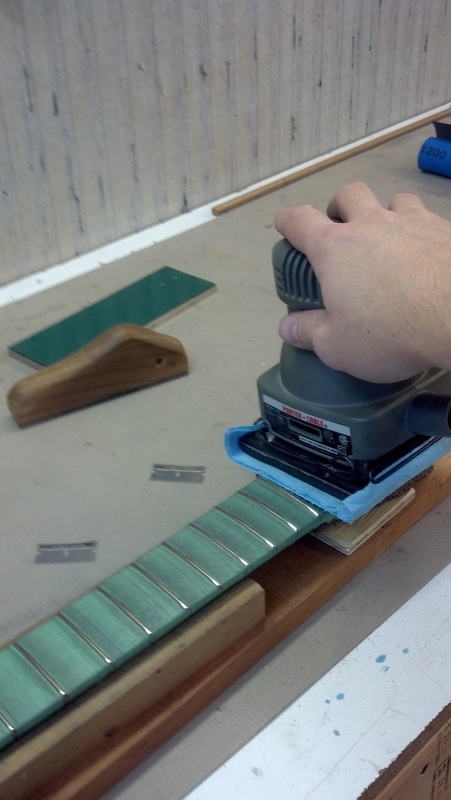 You have to move the palm sander in the direction of the frets from side to side. 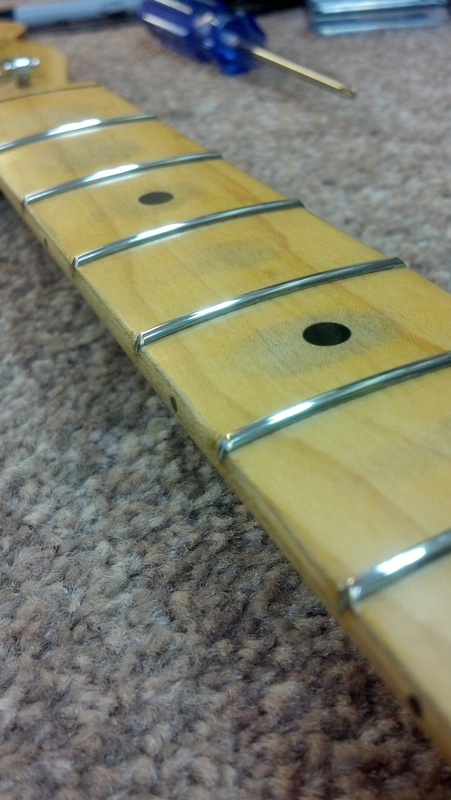 If you try and go back and forth down the fret board, the shop towel will fall apart easier. I use the blue shop towel because they are quick and easy and I don’t have problems with my technique. You can cut up some old shirts if you can’t get shop towels to work for you. 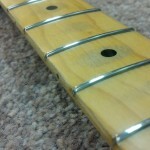 When the frets start to really shine, I turn off the palm sander and remove the shop towel. Then I use the clean side of the shop town to wipe off any excess polish. I can now peel the tape off and take pride in my work. Look at those frets shine! 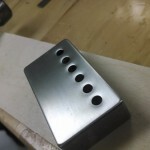 Thanks for looking and keep checking us out for new products and information here at our blog and also at www.mojotone.com! Like Mojo and Win in February! It’s not often that we make mention of local businesses but this just – sorry – takes the cake! Thanks, Monique, for not only one rockin’ amp but the best tasting amp we’ve ever had! MOJO MUSICAL SUPPLY ANNOUNCES THE ACQUISITION OF LOPO LINE, INC.
BURGAW, NC – January 16, 2012 – Mojo Musical Supply is pleased to announce an agreement to acquire Lopo Line, Inc., manufacturer of high quality boutique and stock amplifier cabinets, located in Apple Valley, California. The Lopo Line acquisition will provide a west coast manufacturing and distribution presence for Mojo Musical Supply, currently one of the industry’s leading guitar and amplifier parts suppliers and amplifier cabinet manufacturers, headquartered in Burgaw, North Carolina. Since 2007, Lopo Line, Inc. has offered amplifier cabinets with an emphasis on quality, competitive pricing, quick turnaround time, and excellent customer service, making such a merger a perfect fit for Mojo Musical Supply as they share those same business objectives and principles. 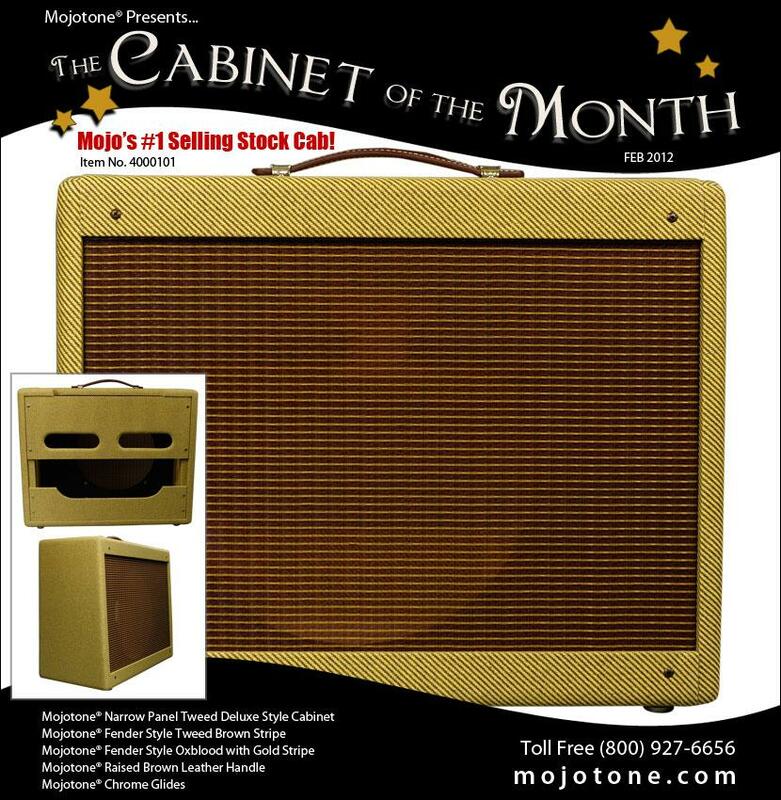 Mojo Musical Supply (www.mojotone.com) has been in business for nearly 20 years and currently manufactures amplifier cabinets for over 90 boutique amplifier companies. With the Lopo Line merger, that number will likely double. The Lopo Line, Inc. acquisition is expected to be completed by January 16, 2012. The holiday season is upon us and we want to celebrate with you! What better way to do so than offering our favorite customers the best gear at even better prices for 12 whole days of December. Because you are the best customers, we think you deserve the best for the holidays. To help make that happen, we are giving you stellar deals on your favorite things for 12 straight days. We are calling it the 12 Days of Christmas sale. You can call it the “12 days of great deals,” “12 days of awesomeness” or whatever you want. Just make sure you call us or check online to see what the deal of the day is. These deals are for you. We can’t wait to make you sound even better than before and we can’t wait to celebrate with you! Check back daily for each day’s special deal! 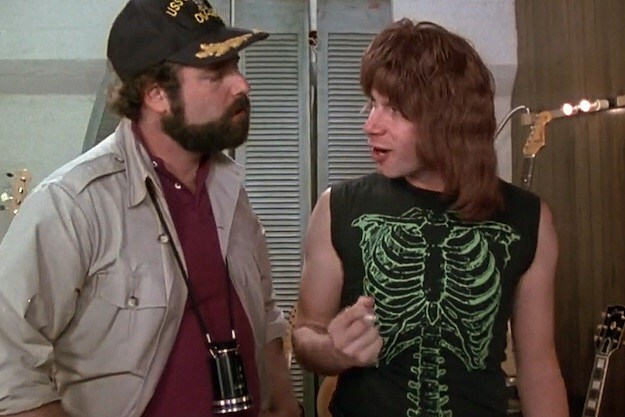 To celebrate the legendary film, Amazon.com, iTunes and X-Box are selling ‘This is Spinal Tap’ for $4.99 between now and Monday. In addition, VH1 Classics and PalladiaHD are airing the film throughout the week. In addition, today is also being dubbed Nigel Tufnel Day. You can keep track of the day’s festivities on Twitter and Facebook at the hashtag #GoTo11.